The GC-EXP1-PRO is a professional quality, all-metal expression pedal designed exclusively for Guitar Center by Mission Engineering. The pedal is compatible with expression pedal inputs on many stomp boxes, multi-effects units, MIDI controllers and keyboards. Simply connect the output from the pedal with a single 1/4" TRS cable to the expression pedal input on your compatible device. The GC-EXP-1-PRO features a custom-designed, 10K Ohm linear, fully sealed potentiometer that works perfectly with most devices, and is rated at greater than one million operations for perfect response and extra-long life. An input level knob on the side allows the adjustment of the minimum level from zero to approximately 80%, making this a very flexible as well as road-ready expression pedal. 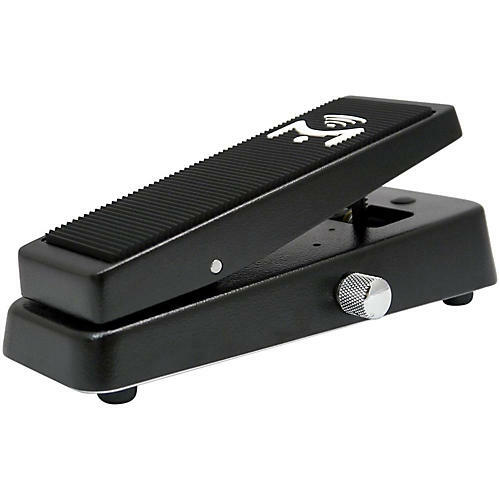 Base length at longest point - 9.9"
Base width at widest point - 4.0"
Height at highest point including feet - 3.25"
Pedal width at widest point - 3.0"
Pedal width at narrowest point - 2.3"